Coating Appearance & Color Variation SAF – Southern Aluminum Finishing Co, Inc.
With all the advances in metal finishing technology during the last ten years, one might think that color variation is a thing of the past. Not true!!! Color variation still exists in finished products, but the reasons for it are more complex than ever. In this article I hope to address the causes of color variation and discuss the probability of a problem with an architect or owner who wants a perfect match. Many people think only anodizing has color variation. This has not been true in my experience. In fact, some of the most severe complaints involve painted finishes because of the expectations for perfect color consistency. When the expectation for perfect consistency exists, one must be very careful when supplying building materials. Part of reason for this is that color alone does not completely describe appearance. Appearance is composed of color, gloss, and texture. All three factors are important in visual uniformity of metal products. Color can be measured with a colorimeter and gloss with a gloss meter. Texture is a catchall term. For metals, texture includes factors related to the base metal such as smoothness, grain, and die lines. For painted finishes it includes factors related to the coating such as metallic flop and orange peel. There is no satisfactory way to include all these factors in a finish specification or to even measure texture in a meaningful way. For the purposes of this article, we will make only passing reference to texture problems although these problems are the source of many complaints. Gloss is usually measured with an instrument measuring the percent reflectance at 60 degrees. A perfect mirror would then have a gloss of 100 and perfectly flat would be 0. In common parlance, a high gloss is 80 or above, medium is 50 – 60, and matte is 30 – 40. Kynar finishes are generally 35 while etched anodized finishes range from 5 to 20. Polished and brightened anodizing will be much higher. Color is normally measured in terms of tristimulus values X, Y, and Z. These values are then manipulated mathematically to yield various color scales. The most common scales are Hunter, CIELAB, and CMC. These scales are composed of three numbers, usually L,a,b or L,C,H. The scales are three dimensional and the mathematical difference between any two points is described as DELTA E. This DELTA E is an attempt to state in one number the color difference between two samples. There have traditionally been problems in relying on DELTA E as fully representing color difference. In some of the older systems, a given DELTA E value appeared different depending on where the sample was on the L(light-dark)scale. Darker colors exhibit less color variation, making it necessary to take L into account. More recent systems such as the CMC make DELTA E values more consistent with what is seen visually. AAMA 611 is a new anodizing specification which has limits established for color variation. It is hoped that AAMA 611 will become an industry standard. The closest thing to a standard for painted and powder coatings is AAMA 605 which has a clause that recommends viewing finished products from a distance of ten feet. Most manufacturers disclaim color consistency in anodizing. Paint manufacturers frequently have labels on their samples which say something to the effect that their samples were prepared under laboratory conditions and actual production conditions may vary. Even so, using a target color is always helpful for both painting and anodizing, even after ranges have been established. Many specifiers and designers do not know that the most significant reason for color variation experienced in the anodizing process is due to variances in the metals used. Most aluminum can be anodized, but most alloys are not attractive after anodizing. Different alloys anodize different colors. Some alloys are more suitable for anodizing (5005, 6063,…) than others (2024, 3003…). Even when an anodizing alloy is used, there is little hope for color consistency between different alloys. For example, 6063 (extrusions) and 5005 (sheets) both are considered suitable for anodizing. However, 6063 and 5005 will appear different from one another when anodized. In addition to alloy it is important to consider temper. 5005 H14 and 5005 H34 will anodize at different rates. Heat is always used in the manufacture of sheet and extrusion so temper is always important. Most primary aluminum suppliers charge extra for aluminum which is designated Anodizing Quality(AQ). This AQ designation is critical if good color is desired, but will not solve the problem of comparing metal from different lots. The AQ designation buys the purchaser the right to return the aluminum to the mill if the metal from that single shipment is not consistent. There is no guaranty implied by the AQ designation that the metal will match a previous shipment perfectly, even if it is designated AQ. Alloying constituents such as zinc, magnesium, and silicon within tolerances of standards for each alloy established by the Aluminum Association, Washington, DC. Metallurgical structure such as grain size, heat lines, flow lines, etc are imparted to the metal as it is converted from ingot to a finished product like sheet or extrusion. Each primary aluminum company will probably have more than one mill location, and hence rolling mill, to make coil. The method used to make the product (rolling, extruding, casting). If sheet, the rolling stand used in the mill. The implication of this is that different widths and gauges may be different, even if from the same lot, because of the grain structure and temper imparted by the casting and rolling process. The method used to temper the metal, including any fabrication process which involves heat. A lot of sheet usually comes from ingots which are produced in very large quantities (at least 20,000 lbs and typically 70,000 lbs) and then rolled into coil. A 40,000 lb lot of coils is rolled from consecutively produced ingots and is produced under nearly identical circumstances. Color consistency may be perfect if the rolling process is executed properly and it is anodized carefully. The coils are then cut-to-length into sheets, either before or after anodizing. The only way to get sheet from a single lot is to order it all from one supplier in one shipment and to specify the metal to come from a single (or consecutive) lots. By definition different alloys can not be made from the same lot, so sheet and extrusion will always be different in appearance from one another. In addition, a mill may not want to supply different gages and widths from a single lot of metal since when they setup to roll a 40,000 pound ingot, they will probably want to roll the entire lot into a single gauge and width to minimize their setup time. I do not think one can order different gauges and widths from a single lot and it is certainly not normally available this way! Some in the industry call a “lot” a “heat,” after the fact that a “heat” of aluminum is used in a primary aluminum manufacturing operation to cast ingots of aluminum. These ingots are then rolled into coils that are cut into sheets and then anodized. Each “heat” should represent a large quantity of aluminum sheet that is homogenous. If a really huge quantity of anodized aluminum is needed, consecutively manufactured lots from the same mill can also be manufactured for good uniformity. Extrusions are more complicated to buy in large lots because different extrusions probably come from different lots of billet. A billet is a casting of aluminum which is pushed through die (like Play-Dough) to make an extrusion of aluminum. Extruders usually buy their billet on the open market and different shapes may come from billets that were cast in different cast houses. Some extruders buy most of their billet from one source. Anodizing color consistency will probably be better from an extruder like this, but still not perfect because the billet may be cast under slightly different conditions, even from the same casting mill. Other processes done to aluminum which cause color variation in anodizing are heat bending of extrusion and welding. Heat bending is a crude process where an extrusion is heated using a torch and wrapped around a steel jig. This process changes the temper of the extrusion and the color may be very different compared to a straight lineal. I have seen curves which would not take an anodized coating at all because the aluminum was heated to a very high temperature during heat bending. Anytime heat is applied, one risks changing the appearance resulting from anodizing. This is especially true with welding. Welded aluminum is almost impossible to camouflage. Grinding makes it more obvious because of the difference in surface texture the grinding imparts. Welding also creates a halo in the surrounding metal because the temper is changed by the heat. Even when the metal is identical there is still variation contributed by the anodizing process itself. I think this source of variation is somewhat overrated because most of the variations within metal are not visible when it is mill finish. They are brought out by anodizing and then the anodizer is blamed for lack of color control that is actually caused by variation in the metal. Fortunately, there are variables anodizers can control which will vary the color of their end-product and if the aluminum doesn’t anodize correctly on the first try because of variances in the metal, it is sometimes possible for the anodizer to modify their processes yielding an acceptable result on the second try. Unfortunately, there is no way for an anodizer to change the metallurgical structure of metal and sometimes there is no way to overcome alloy differences in color. Dye used, saturation vs unsaturated. Type of solutions used. For example, different 2-step solutions. Racking method (square inches of actual current-carrying racking area). Current density variation caused by part configuration, causing voids and shielded areas in the finish. Coating thickness for architectural use is usually specified as either Class 1 and Class 2 per Aluminum Association publication DAF 45. Thick coatings (Class 1) are generally darker than thinner coatings for a given alloy, even with Clear anodizing. It is surprising how many people are not aware that clear anodizing can vary!! There are several ways to color aluminum. If you’re trying to make aluminum bronze, there are at least three ways to do it. They are two-step, integral color and dying. With 2-step, there are tin-salt based and cobalt based solutions, as well as others. The only way to minimize color variation is to have one anodizer do ALL the finishing for a given project. This is often not feasible. Accordingly, it is helpful for a finisher to be given a sample of the other finishers products for matching purposes, especially when trying to match existing material. When dying aluminum, it possible to achieve different shades by dying aluminum in the same solution different lengths of time. As the time increases, one reaches a point of diminishing returns and eventually the aluminum is dyed to saturation. To minimize color variation, it is recommended to always dye to saturation. This also serves to maximize a dyes resistance to the elements. Sometimes anodizers will dye on top of a bronze 2-step finish, a process called overdying. In this process, the degree of color variation can be caused by the coating thickness, the bronze process and the dye process. If all three variables are close to the extremes of their acceptable levels, severe color variation can result even though the variables were all within acceptable limits. This is called “tolerance stacking.” However, when tolerance stacking is controlled, overdying results in a palette of metallic colors of unsurpassed beauty. Because of all these potential sources of variation, one might consider anodizing color range panels showing the representative amount of expected variation. Often members of the construction team misinterpret range samples as specimens of the actual color. Usually range samples are prepared months ahead of the job and can not be made from the same lot of metal that will be supplied on the job. For this reason anodizing range samples are NOT meant to be a specimen of an actual color like paint samples, but instead are meant to be representative of the degree of potential variation. “Range” samples imply a two dimensional color system: light to dark. In reality color and appearance is at least four dimensional: gloss; and tristimulous values like “L”, “a” and “b” To define anodized aluminum in terms of a two dimensional range is nonsense. Randomly chosen range samples should always be accompanied by the idea that they are representative of possibilities. It may not be possible to represent the amount of variation between sheet and extrusion. The difference in appearance between sheet and extrusion can be enormous. Fortunately sheet and extrusion are not normally expected to be identical, and are used adjacent to one another in construction everyday. Members of the construction team should reasonably expect the sheet to match itself, and for the extrusion to match itself. If the anodized aluminum sheet perfectly matches the anodized extrusion on a building, then everyone just got lucky, tolerant or both. If actual color samples are needed, then the anodizer must use metal from the actual lot that will be provided on the job. This will allow the anodizer to represent the actual appearance that will be supplied, but does not take into account variables such as load size, process conditions, and installation variables (see below for installation variables). Though anodizers always try to establish the expectation for color variation, the anodizer can do a better job by having both range samples and an actual target sample of the color they are trying to achieve. Range samples are important, but a target is critical for any large anodizing job. A target should be requested from each finisher anytime a large quantity of anodized aluminum is used. An analogy might help illustrate the need for a target. A coil of aluminum is analogous to a bolt of cloth that a tailor would use to make a suit of clothes. A tailor would be irresponsible to make a suit of clothes from different bolts of cloth that were manufactured at different textile mills. A tailor is expected to manufacture clothing from a single bolt of cloth so that all the components of the suit will have the same appearance. I’ll make two more comments about range samples. First, a metal-flake paint coating can have as much variation as anodized anodized aluminum and for some of the same reasons. If the construction team expects perfect uniformity, then an opaque earth-tone painted finish should be used. Secondly, the anodizer should provide all members of the construction team copies of targets and range samples if they are approved by the architect. Most importantly the installer should have copies, because if one of the building-product suppliers provides anodized aluminum that is outside the approved color range, the installer should not install it. Another consideration in color variation is installation. Because anodized coatings and 3-coat Kynar 500 systems are translucent, their appearance will vary with viewing angle. Panels installed in a row must be installed exactly parallel like a glass wall. Even a few degrees of deviation may cause a difference in appearance or non-uniformity. The installer should also be aware of the variability in anodized materials and sort by elevation for the desired effect. Some anodizers now have color instruments for measuring color. A specifier might request that each panel should be labeled with its color values, so the installer may sort them during installation. The installer should take care not to put dissimilar colors adjacent to one another. The specifier should also take care not to put different alloys adjacent to one another in the same plane. For example, if sheet is installed next to extrusion and they are in the same plane, some architects find the resulting unavoidable color variation unacceptable. It is often difficult to convince specifiers that color variation occurs with painted products, but indeed it does! The color of paint depends on application conditions and the batch of paint made for the job. There is slight variation in paints from batch to batch and from setup to setup.. This variation is more noticeable on metallic colors. A batch of paint is the amount that is mixed together at one time by the paint manufacturer (or applicator if they have a mix and match system.) With powder coatings a batch is the amount that is mixed and then ground at one time by a powder manufacturer. Batches of powder tend to be bigger than solvent born paints, because the powder grinding equipment is expensive. It is costly to make small batches of powder. In contrast small batches of paint are easily made by the applicators themselves. A factory direct batch of paint may appear different from a batch of paint mixed by an applicator. Applicators can get very close, but a perfect match is unusual. The only way to get a nearly perfect match on painted or powder coatings is to use one batch of paint or powder AND to paint everything ALL AT ONE TIME. Even when the same batch of paint is used, if there is more than one setup by the applicator, the potential exists for color variation. These differences are caused by the many variables in the application process such as cure temperature, solvent/paint mixture, coating thickness, application technique, and airflow in the curing oven. I have especially seen this with lighter colors. There is often a difference in appearance between coatings cured in an electric oven and a gas oven. This is probably due to the temperature variances and the air flow unique to each oven. Oven size can also be a factor in cure temperature variations. Because painting all in one setup is sometimes impractical, some degree of variation in color, surface texture or gloss is to be expected. Because of the inherent variation during production, it is generally unwise to place material from one applicator adjacent to material from another applicator. There are some kinds of variation that are particularly evident with translucent three-coat metal flake metallic spray coatings. Exposed surfaces more than one spray-gun-pass wide (about 18″) will reveal more variation than narrow extrusions. These spray-gun-passes are called lap marks. With translucent three-coat metallic coatings, panels more than 18″ wide will often show lap marks when viewed at certain angles, under certain lighting, at certain times of day, or from a certain distance. These marks are often impossible to see in a factory situation. This makes QC?ing such a job extremely difficult. As with anodizing, the color of metal flake metallic coatings will change with viewing angle. This is due to the flop of the metallic flakes within the coating. These flakes give the coating a depth of color that is visually exciting, but also makes perfect color uniformity impossible. The viewing angle effect puts a premium on straight line installation. Panels that appear the same color when viewed in the same plane will look different if cocked only a few degrees out of level with each other. 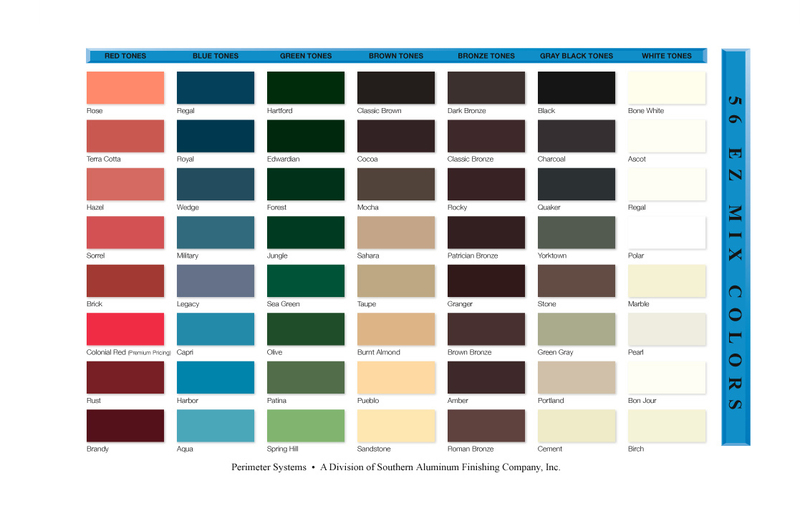 We have seen jobs where the most objectionable color variation was due solely to the installation process. Different resins will appear different. For example, a white Polyester will look slightly different than a white Kynar 500 coating, even when they are formulated to match. The difference is due to surface texture and gloss, not necessarily pigmentation. The same kind of differences can be seen in powder vs. spray, even for the same color and resin. Surface defects in the metal are sometimes the cause of color variation. This is especially true with very thin coatings such as Kynar where the coating thickness is only 1.2 thousandths of an inch. If the metal is sanded before painting, the sanded region may appear darker than the surrounding area. Painted and powder coatings will not cover scratches nor scuff marks. I consider it impossible to guaranty that painting will cover up surface defects in the metal. Even water stain can sometimes be seen after painting because of the difference in surface texture it causes. Coil and spray coatings will also exhibit variation from one another, even when the same resin and pigmentation is used. This is because the coil coating process and the spray coating process are fundamentally different. Coil and spray coatings are formulated differently, and the application conditions are very different. A good example of this kind of variation is when roofers fabricate coil coated sheet into straight lengths of roof coping and install it next to welded corners that have been spray coated. As with anodizing, be careful whenever placing painted sheet adjacent to painted extrusion, unless the sheet is spray coated at the same time as the extrusion. Coil coated sheet can be very different from a spray coating of the same ?color.? Because the lot sizes are so much larger with coil application, variation is not as common within coil coatings. However, the only way to guaranty perfect consistency with coil coatings is to order all one thickness and a single width and take it all in one shipment. Different thickness’ and different widths are painted in different setups at the coil coater and variation may occur. The larger coil coaters like to paint at least 40,000 lbs of a single color, thickness and width at one time which should result in uniform color in that 40,000 lb lot. Coil coating variation will occur between manufacturers and from lot to lot from the same manufacturer. A metal distributor, having bought from several different coil coaters, may have metal in stock which varies slightly which they may ship to their customer in a single shipment. Because this can happen, be sure to check all incoming shipments for color variation before installation to prevent a problem. I do not wish to over emphasize the problems with coil coatings. Because the batch sizes are so much bigger and the process is inherently more controllable than spray application, coil generally has better consistency than spray coatings. Spray will usually appear slightly different from coil, and coil coatings themselves can occasionally vary from lot to lot. When possible, finish all the metal at the same time with the same applicator. If a single setup is not possible, then have a single finisher take responsibility for all setups. Try to figure the total finishing requirements in advance. This will make the first two suggestions possible. If the first two suggestions are not feasible, then be sure all finishers have identical color samples. This is critical, especially when matching existing material. Use care during installation. Once materials are installed, there is nothing anyone can do to make the finish match while meeting the original coating specification. Field applied coatings are never as consistent or durable as factory applied coatings. Avoid the use of touch up paint. For the reasons above, touch up paint will never match the factory applied finish. Don’t expect products which must come from different manufacturers to match perfectly. Avoid designs where matching problems are likely to occur. If the expectation exists in advance for perfect color consistency, find out the costs involved and determine the feasibility of tight color control. If it is not feasible, address the problem with the project team.